Included in this file are 4 sight word games, featuring words from the Dolch Pre-Primer, Primer, and First Grade lists. 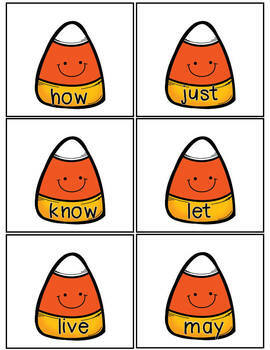 Halloween Sight Word Boo!- Students choose cards from a basket, such as a cute Halloween pumpkin bucket.. If they can read the word, they keep the card. If they can't, they put the card back. 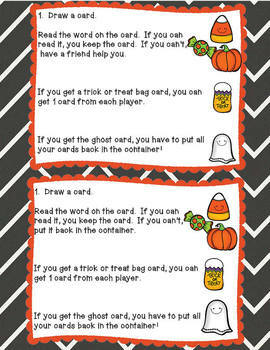 If they choose the Trick or Treat bag card, they get one card from each player. If they get the ghost card, they put all their cards back. This is a great, fun way to practice sight words! Your students will love it! Halloween Concentration- Students choose pairs of cards and try to find the matching sight word. If they find a match, they keep the cards. Students play until all the cards have been matched. The student with the most cards wins! You can also use the Boo! cards for a fun twist on the traditional Concentration game. Trick or Treat!- This game is played like "Go Fish!" The student asks for a card that matches one of their sight words. If the other student has the word, they give their card to the first student. If they do not, they tell the student "Trick or Treat!" and the student chooses a card from the pile. Once all the cards are matched, the game is over. The student with the higher number of matches wins. 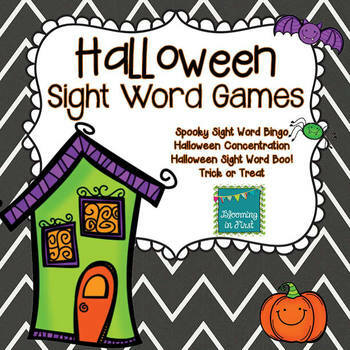 Spooky Sight Word Bingo- There are 20 different Sight Word Bingo games, both in color and blackline (so there are 40 total). These games are perfect for your first graders, advanced Kindergarteners, or struggling second graders! They are also perfect for any students who need sight word practice! They are easy prep- print on cardstock, cut out, and go! Looking for more sight word games? You can find sight word games for all seasons in my store! Please check out my blog at Blooming In First!